Slide, Elite Carry, .45 ACP, PVD Finish, 5-7/8", New | Gun Parts Corp.
New, custom grade quality slides from Para USA. 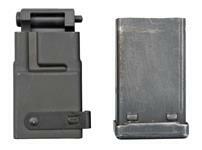 The slide has the series-80 style firing pin slot and a flared ejector port. Features precision-engineered fit and finish. Available in different styles, models and calibers. NOTE: No internal parts included.